Amy's brothers Georgie and Roland were the only brothers in the First World War to win the V C, but Amy herself seemed almost unaware of the fact that her brothers were great British heroes, and perhaps it was that the underlying grief was just too great to allow her to think of the other side of the coin, about the fame of the Fighting Bradfords or Battling Bradfords as they became known. Throughout the war, all four brothers kept up a regular correspondence with one another, but more especially with their young schoolgirl sister Amy. The letters were short, but were written regularly and nearly always contained some humour. Yes, I saw that Wilde beat Symonds, I have seen the latter box. You are very observant to have noticed it." As regards this confirmation, another of the brothers gave his sister a piece of advice which was wonderfully comprehensive and characteristic of the family......."Never do anything that you would be ashamed to tell your father and mother....... and brush your teeth." Concerning this piece of advice someone has commented .. "much thought and eloquence might be spent over candidates for Confirmation without arriving at advice so simple and so sane." This sanity which was characteristic of all the brothers was George Bradford's to a remarkable extent. He never talked about religion, he would have thought it arrogant if not actually improper to do so, but he lived it calmly and consistently. And the result was that his influence over both men and boys was enormous. They trusted and loved him. 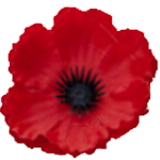 "I apologise," he wrote to his sister, for omitting to thank you for 'The Student in Arms', it is very good. . . . . Good luck to you at school, keep the Bradford name like that of Bayard, 'chevalier sans peur', possibly mis-quoted but conveys the right idea. I think the war is going on well and the prospects excellent. Don't allow anyone with a long face to say otherwise. This is my personal propaganda, and I am sure it is right." 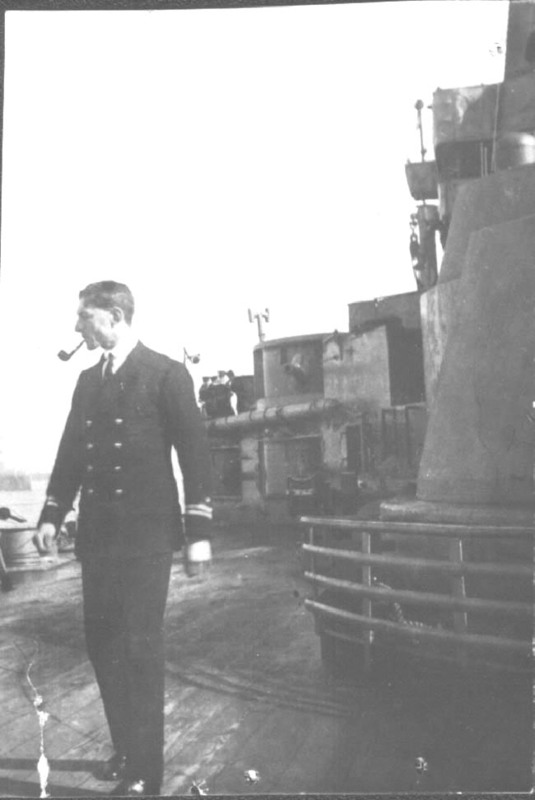 Undated photo of Lieutenant George Bradford. . strolling off duty along the deck. And a letter which George wrote during March 1917 is as fatherly as it is brotherly. "Jimmy (the 3rd brother) has been doing very well, and I trust a grateful country may give him a decoration. I think he strongly deserves it for his all-round ability and most of all, tenacity, or in the homely, expressive, but unladylike phrase 'guts'. . . Talking of . . . reminds me of those nauseating pictures in the . . . . of Society ladies in toy Red Cross gear; there must be a lot of good in them though in spite of the foolish parading. Hope the foot is better. Look out that you walk on your boots and not over on one side only, like so many girls. Just notice if I am not right." Writing again on 1st July 1917 he shows how thoughtful he was of his mother. "You are quite right about the canoe, the stern is the place to steer from, only great men like me can do it from forward. I suppose you liked 'David Copperfield'; 'Dombey and Son' is one of my favourites. You should give Mother an optimistic letter from time to time, she has been much shaken by her illness and Jimmy" (who had died of wounds in May 1917). Weather here glorious, winning the war, in fact everything going splendidly. No aches, no pains, a pleasure to be alive." Writing a month later he says to Amy: "Moi, I am a Lieut. Commander, having completed eight years as Lieut. . . The D. Mail says that the Durhams have enhanced their fighting reputation in the recent offensive; I hope the Colonel (Roland) is all right and has done well." And then in a postscript he refers to a phrase that ran rampant over England and has not yet concluded its run. "What does 'simply priceless' mean? You should try to preserve our beautiful old English language!" Towards the end of September in the same year George proved himself a true prophet. He wrote "I have just read that school book 'The Loom of Youth' by Alec Waugh, who was only 18 years old when he wrote it. It is V.G., but to me it seems somewhat precocious. How goes the war with you, does grub seem plentiful in the country? I think before we see the end it is going to test the endurance of all the fighting countries, not so much the actual soldier and sailor, but the civilians. Au revoir, keep cheerful, if only to encourage the others, there is nothing like being a Mark Tapley." All the letters quoted thus far were written by George Bradford to his sister from H.M.S. Orion and were signed "Your affect. brother G.N. Bradford" and in one which he wrote in November 1917, he drew an arrow pointing at the initial "G" and added, "Curious thing, I have never written 'George' in my life. A quaint family i'faith, pukka Dickens' characters." Proud and fond of his family as George Bradford was, he never ceased to be amused by either their or his own peculiarities. 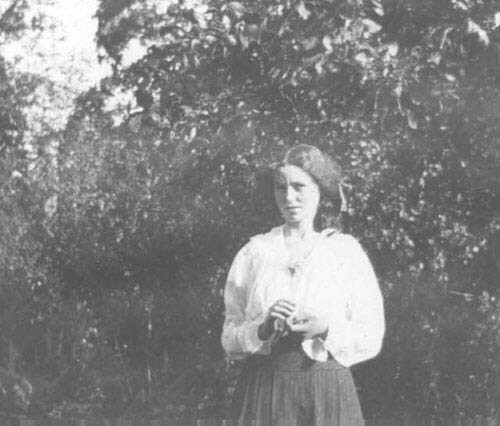 In the same month (November 1917) he wrote to Amy:- "The idea of you getting a sewing certificate amuses me, still it is V.G. work and 'even the ranks of Tuscany can scarce forbear to cheer'. I won't be able to come home for Xmas, but will doubtless be keeping the pot boiling in the North Sea, which will serve a good purpose. I think the Huns will have had all they want by this time next year. Still qui vivra verra, moi qui vous parle (you have surely noticed that people who are real duds at a language almost invariably quote it) encore chacun a son gout or something fairly near that." And he concluded this brief excursion into French by asking his sister to cheer up their mother as much as possible. "She has done a lot for us, and at present leads a very lonely life." But before George wrote his next letter to Amy their brother Roland had been killed. "Poor old Roland will live in history, a marvellous leader of men and died a glorious death." Early in 1918 George Bradford left the Orion to prepare for the Zeebrugge operations, and in March he wrote from H.M.S. Hindustan: "The above is my address till I tell you otherwise. I shall go back to the Orion later on probably, as my present is only a temporary job." In this casual manner he refers to the coming attack on Zeebrugge, which was to cost him his life and at the same time give him undying fame. Continuing in the same letter to Amy he said: "T.A.B. (their elder brother Tommie Bradford) and I stopped one night together at the Berners Hotel, and went to see 'The Bing Boys on Broadway'. We enjoyed it, but came to the conclusion that our artistic senses are not very strongly developed. . . You should read Julius Caesar, Macbeth, Hamlet, Coriolanus, T. of Athens, Henry IV, V, VI, R & Juliet at your leisure. They are extraordinarily good." Writing again from H M S Hindustan, at the beginning of the month in which he was killed, he said: "I think you would make an excellent nurse and hope you get the chance. . . There are some very good verses in the present 'Punch by O.S., who always seems to me to write sense. . . . The fighting in France must now be terrific, our civilian population always appear to be best when we are up against it. The Paris bombardment is just the theatrical business that appeals to the German mind. Confound their devices. I like the ship and my work very much." And then a few days later came the very last letter which his sister received from him . . . during the whole war he had been collecting Naval crests for her, and he rarely sent a letter without adding to her collection. "Herewith a few crests", he wrote in this most characteristic letter, "I see you are doing well at School, the Bradfords are all clever, fate I suppose! Happy returns next month; '3 in May' as you used to say. Au revoir, don't forget the Chevalier Bayard, sans reproche, etc. your affec. brother, G.N. Bradford." Before "3 in May" George Bradford was dead, but the chorus of praise that he won, not only for his death most glorious but also for his wonderfully sympathetic, helpful and trustworthy life, has the genuine note that can be neither mistaken nor misinterpreted. 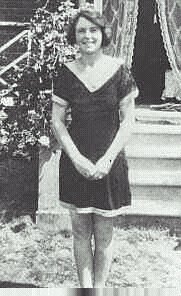 Amy Bradford at 19 in a very "mod" 1920's swimsuit! !